When you take time to speed things up, the making of art becomes more fun. Well, I can’t speak for everyone, but I sue am enjoying the approach. The image (left) in charcoal and gesso was one of the first portraits of the term (week 3). We took some time during the second week in conte crayon (mine at least) but this one was different, emotion, depth, scale, value – all things seemed to work in this one. 4 days left (as of this posting) and I will be sad when it is all over and done. I regret not knowing the names of all my classmates (but that isn’t much different than my school year and all the students I have in class – my bad). Something to work for this week. All my “homework” is done (40 figure drawings and 10 masterpiece recreations) and my last 2 projects are in the bank too! The final project was a portrait based on the work of a current figurative artist – I chose Elizabeth Peyton. My take on it is my brother Scott. 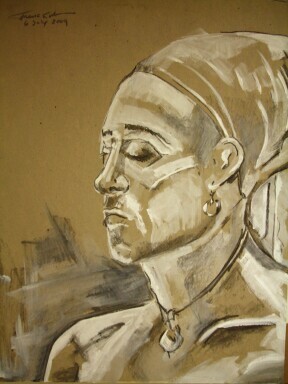 The third (of four) projects was a portrait in mixed media – I did four – overachiever that I am. Please visit the link at the top of this page to see more of the works. I am still working on the names of the pieces (a lot of time crunching the webpage) so please bear with me. Please, let me know your thoughts – I am looking forward to any comments you may have.